Posted on Sunday, March 11th, 2012 at 6:14 pm. 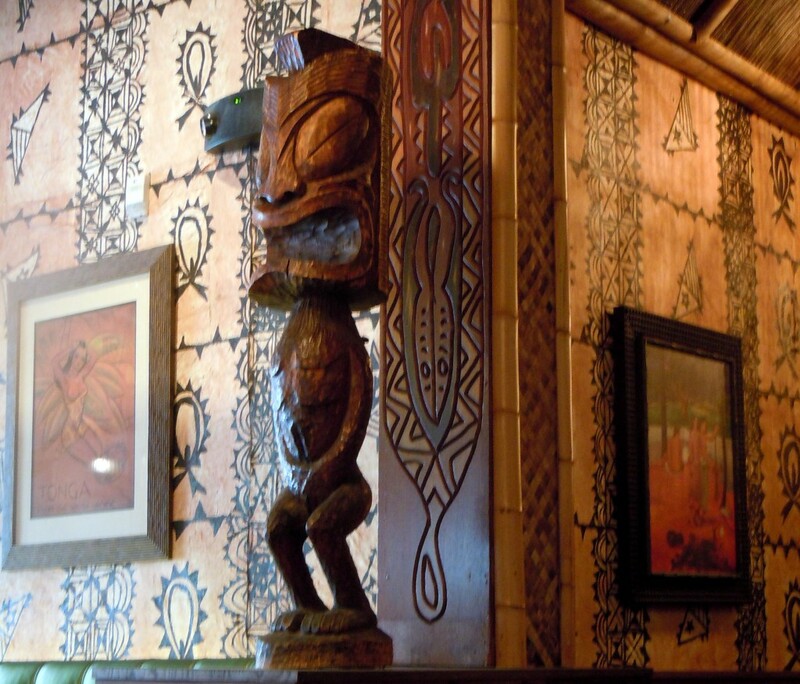 Light the tiki torches and head on down to Trader Vic’s for brunch! That’s exactly what we did on a rainy Sunday morning…well, sans torches. (We didn’t want to scare the other patrons.) 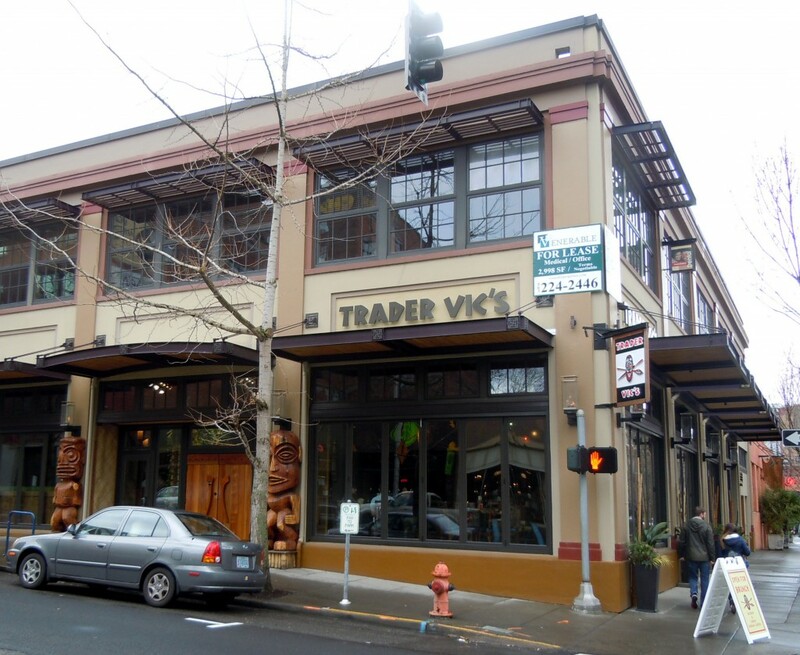 Known for fabulous tropical libations, Trader Vic’s is now known by this hash aficionado for their tasty Confit Duck Hash and a truly remarkable Root Vegetable Hash. Read on! I arrived early, paranoid that my passive-aggressive clock had turned itself back while I slept. (Stranger things have happened). Dubbed the “daylight savings” hashcapade by Janel, most of my tweeps showed up, but a few slept snugly while we soaked in the tropical ambiance and sipped creative libations. 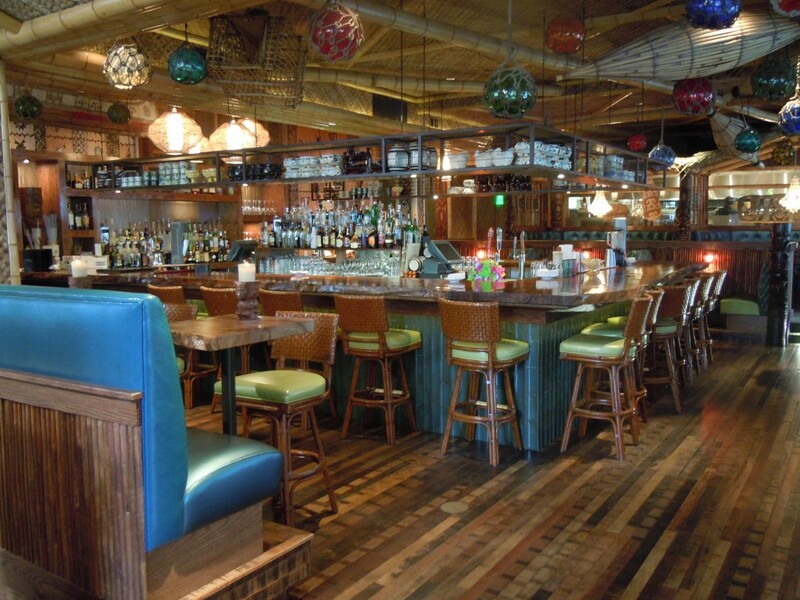 Trader Vic's bar is enormous! As we bemoaned our government-sponsored sleep deprivation transition, I excused myself to take pictures, hoping to capture the spirit of this hash adventure. Tiki style furniture, statues, masks and hanging glass floats transported me to the south pacific. I imagined the smell of the sea and a blazing sun warming my body to its core. I imagined beautiful maidens bringing drink after drink after drink. “Uh, oh! Time to use the restroom,” urged the potty dance statue! Is this statue on the way to the restroom doing the potty dance? 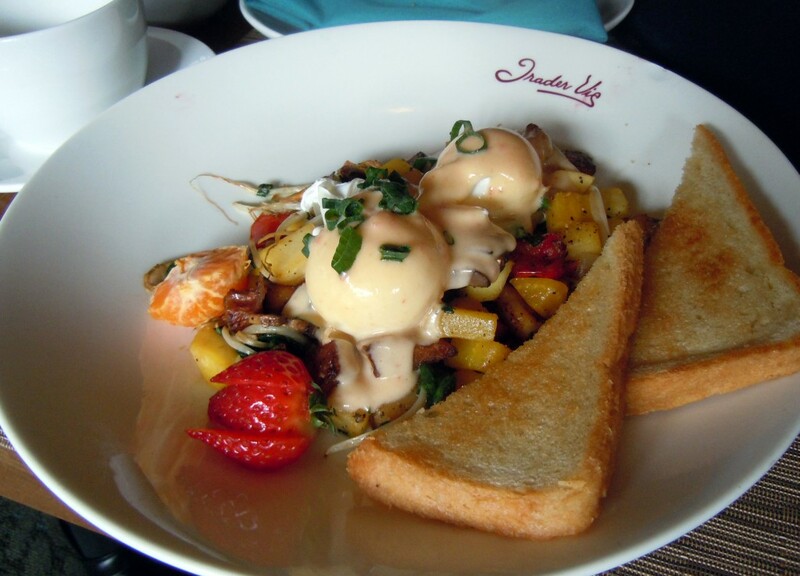 Returning from my all too brief and exotic daydream, our servers were efficiently distributing some epic brunch goodness – Confit Duck Hash, Root Vegetable Hash, Vic’s Benedict and Belgian Waffles – yum! Root Vegetable Hash is super yummy! Starving, I voraciously attacked my Confit Duck Hash. The crispy confit duck, roasted potatoes, onion and poached eggs were tasty. 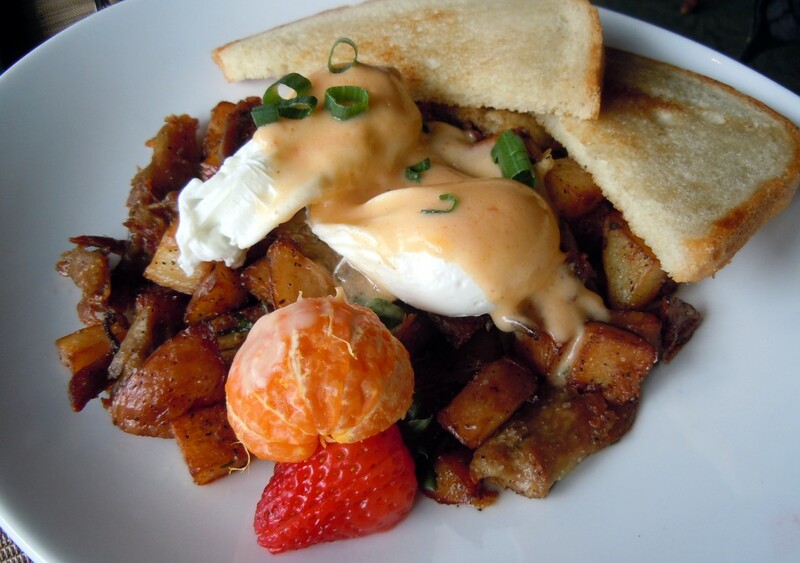 I especially liked the sriracha hollandaise which gave the hash an extra kick. However, the real star was the Root Vegetable Hash – carrot, spinach, parsnip, potato, onion, mushroom and bean sprouts – yes, sprouts! This superb mèlange of veggies was simply delicious – earthy flavors, succulent veggies and a creamy yolk sent me over the edge – amazing! Thanks to my hashcapade posse: Cory, Mary, Nick, Lisa, Janel, John, Richard, Matt, Ori, Darla, and fresh from a run, Lisa and Dawn; and special thanks to Karah, Mikel and Alex for friendly service and big smiles! I has the confit duck hash too, and it was excellent! A good time was has by all. Thanks and great to meet you, Richard. The lively chatter, tasty libations and festive mood of a hashcapade simply cannot be beat! I missed another one?? See what happens when I take off for 5 weeks. Hope to be at the next one. We shall coordinate calendars to make sure you and John are able to make the next hashcapade!